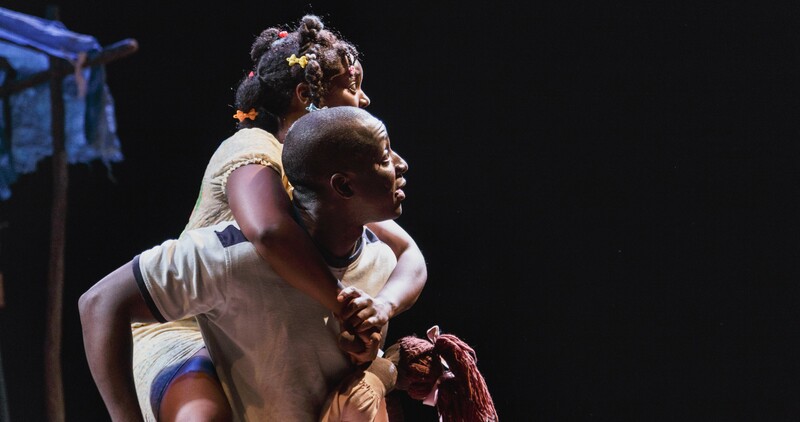 Jeff Augustin’s fiercely passionate “The Last Tiger in Haiti,” directed by Joshua Kahan Brody, peers into the lives of Haitian restaveks, children sent to live with other families as domestic servants, often under conditions similar to slavery. 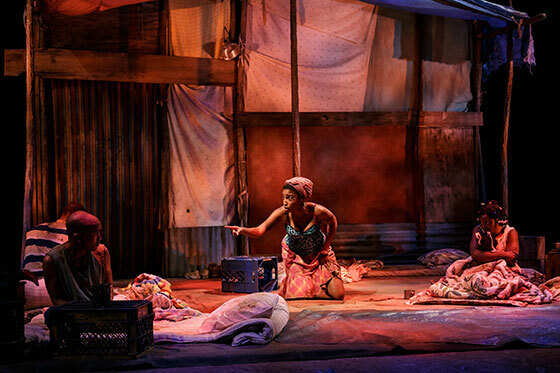 Developed in The Ground Floor at Berkeley Rep, this vibrant show masterfully demonstrates the theater’s ability to offer entertainment while advancing social issues. Reggie D. White, Jasmine St. Clair, Clinton Roane, Andy Lucien, Brittany Bellizeare. Photo by Jim Carmody, Berkeley Rep. These five teenage restaveks, Max (Andy Lucien), Joseph (Reggie D. White), Emmanuel (Clinton Roane), Laurie (Jasmine St. Clair), and Rose (Brittany Bellizeare) often refer to themselves as “trash.” Constantly overworked and undernourished, they are frequently abused by their master and his wife. They live together, crowded in a small hut made of a few wooden poles and some ragged bed sheets. Their worldly possessions amount to four candles, the dirty clothes on their backs, one doll, and a bottle of rum filched from the master’s cellar. The youthful cast portrays their characters with fervor and care. They lost their childhoods long ago to the hardships of slave labor and abuse. Rose, the youngest of the group, played by the versatile Bellizeare, maintains her childhood innocence. Mysteriously, she seems to receive special treatment. 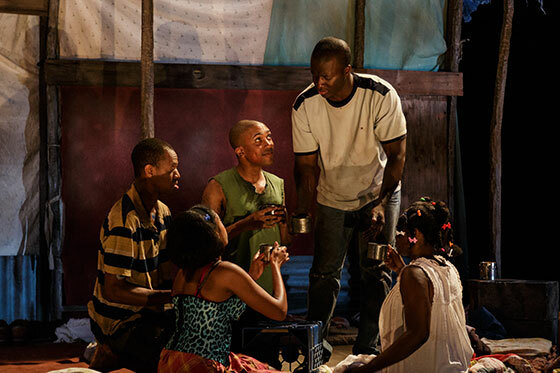 “The Last Tiger In Haiti” brilliantly showcases the folklore, stories, and songs of Haiti. Augustin uses words as well as song and rhythm to tell magical, ritualistic tales in the much longer first act. Then, in the second act, he shifts to a luxurious beachfront home outside Miami, many years later. The radical separation in time and space forces critical questions on us about the art of storytelling. Who owns folklore? Who should receive benefits from it? Does truth have a place in storytelling? The oldest among these restaveks, 18 year old Max (Lucien), emerges as diplomat, protector, and most experienced storyteller. Lucien’s energetic portrayal of an abused and angry young man bristles with his tense awareness of constant dangers. Clinton Roane, Jasmine St. Clair, Brittany Bellizeare. Photo Jim Carmody, Berkeley Rep. The lovely and evocative Laurie (St. Clair) captivates us with her grace under oppression. Her folktale, “The Magic Orange Tree,” transforms the room with its beautiful, melodic refrain. Through song, she embodies the hardships faced by these impoverished and abused children. Then, in a twist, she demonstrates her latent desire for revenge against their cruel oppressors. St. Clair capitalizes on her moment to create a sublime representation of ritualistic folklore. In the second act, time leaps and culture shifts to an encounter years later between Lucien and Bellizeare in Miami. The little girl he protected is now a woman and has parlayed her history into a successful memoir. Bellizeare handles the transition of her character across several decades with fluid grace. Her accent is hidden, her beachfront home is sleek and modern, and she has a fully-stocked bar and a record collection. In this setting, worlds away from their childhoods, the two make difficult small talk before delving into harsh debate. They disagree violently about the story Rose has told and the hero she created. Her story reveals shocking news. Their confrontation reveals how differently things can play out for a person who comes from the same place, but has a few key advantages. 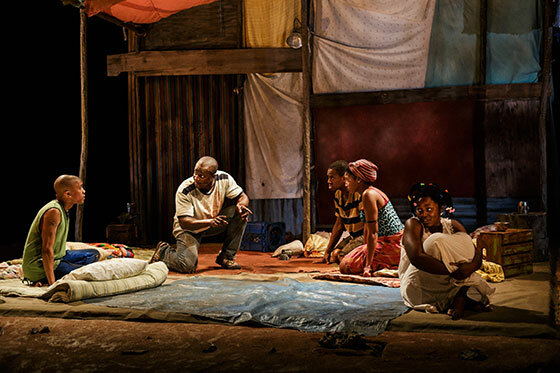 Mesmerizing and disconcerting in turn, “The Last Tiger in Haiti” challenges our complacency, inspires compassion, and highlights the power in bonds of family and friendship. These bonds have only been a dream for the abandoned and enslaved children portrayed by Augustin and Brody. As a contemporary folktale, “The Last Tiger” prowls through our thoughts, pounces on our emotions, and finally offers its own beating heart laid bare. Rose: Brittany Bellizeare. Max: Andy Lucien. Emmanuel: Clinton Roane. Laurie: Jasmine St. Clair. Joseph: Reggie D. White. “Nogales” Blends Border Stories and Satire, at Magic Theatre, S.F.